Minnesota's Niklas Backstrom, who is 5-11-2 with a 3.02 goals-against average and .899 save percentage in 21 games this season, isn't likely to play again during the 2013-14 campaign, due to lingering injury concerns. 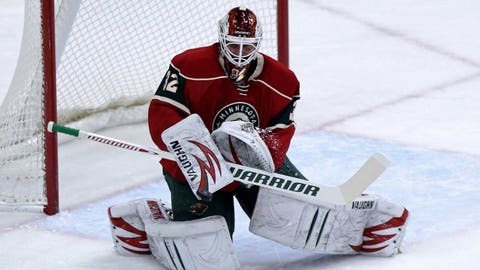 ST. PAUL, Minn. — Minnesota Wild general manager Chuck Fletcher had a tough talk with veteran goaltender Niklas Backstrom this week, knowing the NHL trade deadline is Wednesday afternoon. Backstrom has dealt with injuries all year and has been fighting through a lingering lower-body injury for a couple of months. Rookie goaltender Darcy Kuemper’s play had eased the burden on Backstrom, but Fletcher and the Wild needed a resolution on Backstrom before the trade deadline passed. The end result is Minnesota decided to shut down Backstrom, the Wild’s No. 1 goaltender at the start of the season, and trade a fourth-round draft pick to the Edmonton Oilers Tuesday to acquire veteran Ilya Bryzgalov. "Over the last couple weeks it’s become apparent that Nik Backstrom was having increasing difficulty playing and after speaking to Nik yesterday, I told him we were going to shut him down for the foreseeable future," Fletcher said after completing the trade for Bryzgalov on Tuesday. "At this point, he’s most likely out for the season. You never know with Nik, but we’re operating under the assumption that he’ll be out until next season." Minnesota will go forward with Kuemper and Bryzgalov, who was 5-8-5 with a 3.01 goals-against average and .908 save percentage in 20 games with Edmonton. Kuemper has made 15 straight starts, a franchise rookie record, and has gone 11-2-2 with a 1.70 goals-against average, a .939 save percentage and two shutouts since Jan. 7. The Wild never expected to be in the position of having to add goaltending depth. They entered the season with Backstrom as the No. 1 goaltender and Josh Harding as his backup. Kuemper started the season in the American Hockey League along with another promising young netminder in Johan Gustafsson. Backstrom re-signed with the team in the offseason, agreeing to a three-year contract to stay in Minnesota, where he owns the franchise record for wins (189) and shutouts (28), is second in goals-against average (2.46) and tied for second in save percentage. (.916). Josh Harding also was ready to start the season after going through medication changes most of last season after being diagnosed with multiple sclerosis in the fall of 2012. But health issues would take their toll on both Backstrom and Harding. Backstrom suffered a knee injury early in the season, which allowed Harding to take over as the No. 1 goaltender and Harding dazzled with a 1.65 goals-against average and .933 save percentage. Harding then had to undergo another change in medication and has been out since Dec. 31 with what’s been described as an illness by the team. He returned to practice for a few days, but hasn’t skated in at least a month and Fletcher said Tuesday there has been no change regarding Harding’s situation. "We’re still hopeful Josh is going to be able to come back and play," Fletcher said. "He’s working hard to come back, but obviously we’re into March now and he’s not skating. If Josh is able to come back that would be tremendous and certainly we’ll bring him back and let him compete. But at this point we have to make the assumption that Nik and Josh will not be playing for us this year and this is the direction we chose to go in." Meanwhile, Backstrom has dealt with a lingering abdominal injury that has kept him off the ice at times. As Minnesota returned from the three-week Olympic break, Backstrom has served as Kuemper’s backup, but has not played since Jan. 30. Backstrom, who is 5-11-2 with a 3.02 goals-against average and .899 save percentage in 21 games this season, had offseason sports hernia surgery but Fletcher didn’t want to speculate if he’s had a recurrence of the sports hernia, which kept him out of the playoffs last season. Fletcher said Backstrom could be headed toward another surgery to help repair the injury. "We’ll find out," Fletcher said. "We’re looking into that right now. I believe so. We’ll take some time. I give Nik a lot of credit. I think a lot of goaltenders would have probably shut down, to be honest with you, probably a month or two ago and he’s battled through it all year. I’m not quite sure he’s ever been healthy this season. "Obviously he suffered a knee injury and a head injury in collisions on the ice in the crease, but I think he’s had some lower-body issues for most of the season that he’s battled through. His pain threshold’s tremendous. He’s a competitive guy and I know he’s really disappointed because the team has taken a pretty strong step the last couple of months and he’s been through some of the lean times and I know he wants to be a part of it right now. But our goal for Nik is to get him healthy for next year. He’s been a big part of this franchise and we expect him to be a big part going forward."